I fell in love with Stranger Things in the traditional way: a three-day binge of the first two seasons and then incessantly talking about it in the family group chat afterwards. After enjoying the 2017 remake of IT, it was hard not to enjoy these plucky pre-teens as they battled the strange monsters that came from the land known as “The Upside Down.” So, of course, I was wildly excited when the new trailer for the show dropped on March 20th. When we last left them, the kids had just come off their defeat of the Mind-Flayer, a terrifying entity that possessed Will Byers (Noah Schapp), the younger brother of Jonathan (Charlie Heaton) and son of Joyce (Winona Ryder). The second season ended with the kids enjoying the Snow Ball dance, unaware that the shadow monster is still in the Upside Down, towering over the school. I mean…The hair. The clothes. The Who. Everything about this trailer is deliciously 80s, and the fact that the kids all seem to be having so much fun is just the icing on the cake. Or at least, until the monster from another dimension tries to eat them again. But we take the good where we can get it, right? So, what am I looking forward to? Other than the promise of more monsters, more mysteries, and more of that glorious 80s hair? Well, the friendship between Max and Eleven, for one. While I was ecstatic that another girl had joined the cast, I was frustrated that Eleven seemed to hate Max almost on sight because she thought that the new girl might like Mike. The trope of girls becoming enemies over a boy is so eye-rollingly stereotypical that I couldn’t help but be disappointed in a show that had never let me down thus far – and I knew I wasn’t the only one. 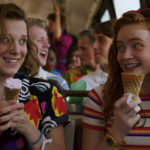 Thankfully, the Duffer brothers seemed to have listened, because Max and Eleven are shown to be hanging out in several parts of the trailer. Billy with his new lifeguard friend, who DEFINITELY won’t get got by the monster or anything. Hopper and Joyce, clearly trying to have a good time but feeling attacked. ELEVEN AND MAX ENJOYING EACH OTHER’S COMPANY AND WARMING MY HEART AT THE SAME TIME. Next? Mayor Kline of Hawkins, Indiana, played by Cary Elwes, who’s described as a typical 80s politician that’s more concerned with his own image than the people of the town he governs (he’s the one shouting “Happy Fourth of July!” at people in the trailer). While I can’t say I know what effect Mayor Kline will have in a story about the supernaturally-beset town, I have to say I’m excited for all the roadblocks an authority figure could throw up. After all, I can’t imagine it will be easy maintaining your image as Mayor when a bunch of kids keep letting monsters loose at the mall. Finally, though, I’m just looking forward to seeing everyone again. Stranger Things is known for its compelling plot, great CGI, and expert handling of horror tropes, but above all, for its carefully rendered characters. And it’ll be nice to remember that they’re just normal people trying to live their lives amongst all the crazy. 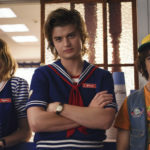 So, what are you looking forward to the most about Stranger Things season 3? The reappearance of the Mind-Flayer? More of Eleven’s siblings? The return of Steve Harrington, single mother of six and the love of my life? Sound off in the comments below, and in the meantime, enjoy the song “Stranger Things” by The Band Royale, inspired by the show.